Drum Corps International announces that King Ultimate Marching Brass has renewed its partnership commitment with DCI through 2010 and has expanded its involvement to the Corporate Level. King Ultimate Marching Brass is a line of marching instruments designed in 2002 in collaboration with the Rockford, Ill.-based Phantom Regiment. Manufactured in the U.S.A. and distributed worldwide by Conn-Selmer, Inc., King has become a highly respected producer of top quality instruments for marching music throughout the world. "During the 2008 season, several top DCI corps will play King Ultimate Marching Brass," said Michael Kamphuis, Conn-Selmer, Inc's director of marketing, background brass. "With Conn-Selmer's strong focus on music education, we see this as a great opportunity to provide more support to the many future music educators that emerge from the ranks of DCI corps." "King Ultimate Marching Brass has been a very good friend to the DCI Summer Tour and to a number of competing corps," said John DeNovi, director of business development for Drum Corps International. "We appreciate their loyalty and tremendous commitment and look forward to another three great years." DeNovi added, "As a valued corporate partner, King Ultimate Marching Brass will promote its involvement with Marching Music's Major League through a variety of outlets including Drum Corps International Magazine, online at DCI.org, in-stadium event advertising, and exhibit space at premier DCI Summer Tour events." Conn-Selmer, Inc. a subsidiary of Steinway Musical Instruments, Inc., a leading manufacturer and distributor of band and orchestral instruments for professional, amateur and student use. The company manufactures and distributes its products under a variety of well-known brand names including Vincent Bach brass, Selmer USA woodwinds, C.G. Conn brass, Armstrong woodwinds, Ludwig and Musser percussion and Glaesel string instruments, among others. 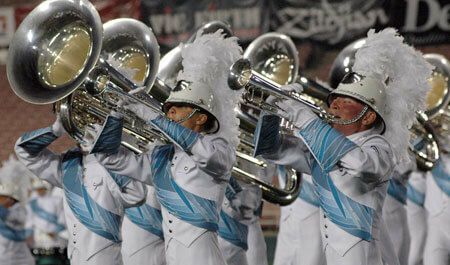 Learn more about King Ultimate Marching Brass on DCI.org or at KingsOfTheField.com.